Body odor or odour, used to be omnipresent. There was no deodorant and insufficient bathing. A public place, especially a confined one just smelled of dirty humans. But what exactly was that smell, or rather what is that smell, because there are many parts of the world where the deodorant revolution has yet to arrive. Our skin is covered in bacteria, that is not odorous in itself, and not harmful. And then we sweat. Clearly if you sweat right after bathing efficiently, there is still no smell. But the sweat contains protein that the skin’s bacteria breaks down into acids, and this is what we are sensing when we encounter body odor. Body odor on our clothing can be address by laundry, but what do we do if we ourselves smell, or if we are in the awkward position of having to tell someone else that they smell? Firstly we have to remove the bacteria by washing, and then we have to do one of two things, either we prevent sweating using an antiperspirant, or we change the chemistry of the battleground using a deodorant. For many people who battle with body odor, the real problem is failing to cleanse the skin properly. You may be offended when someone tells you this, but there are some people who take a shower or bath, and yet fail to remove it. It could be that the very deodorant that you use to attempt to control the body odor has formed a residue that holds onto bacteria and stops it from being washed off. The solution here is to scrub the armpit and surrounding area with something like a Japanese washcloth or a loofah, and soap. Soap containing anti-bacterial agents such as, for example, tea tree oil, will be ideal for this scrub up. If the armpit is hairy, then sometimes that hair is a lost cause, as it may contain such a waxy buildup of deodorant product, protecting perpetual bacterial reserves, that the only way to get clean and odor-free is to shave it all off. This completely efficient bathing is the most important step and sometimes all that is needed to address the problem, but usually the next stage is also required. Depending on body chemistry and diet you may either have hardly any smell at all, or you may, after a short while, produce a lot of stink, despite proper cleansing. Starting with a perfectly clean armpit area, you can apply a thin coat of deodorant, which will change the chemistry of this reaction between bacteria and sweat so it smells different and not unpleasant. Or you can choose to use an antiperspirant which will prevent the sweat from entering the above equation. Bacteria plus zero sweat does not equal acid. 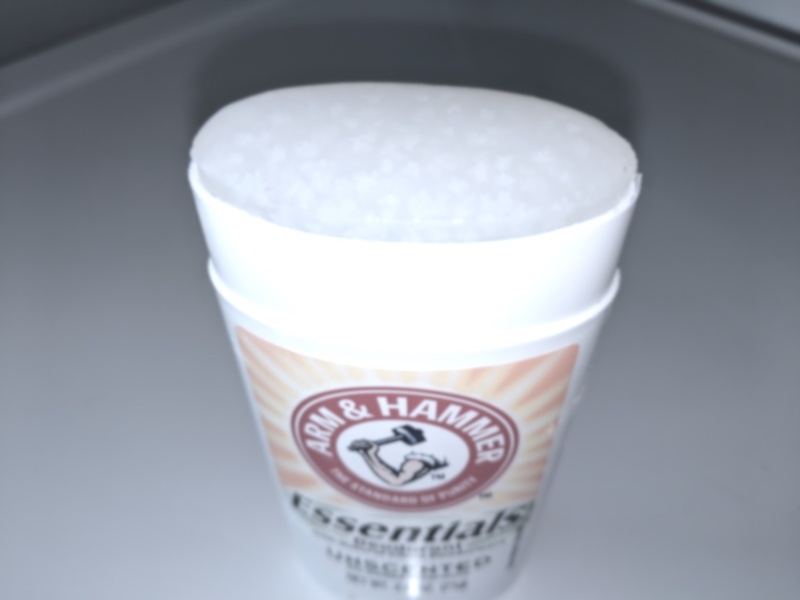 Antiperspirant is aluminum (aluminium) in solution. The metal blocks the pores and stops the sweat. In some cases silver is used but almost all antiperspirants use aluminum, either as Aluminum Chloride, Aluminum Zirconium Octachlorohydrex GLY, Aluminum Chlorohydrate, Aluminum-Zirconium Tetrachlorohydrate GLY, Aluminum Chloride Hexahydrate, or some other similar compound. The aluminum-based chemicals react with electrolytes to plug up the sweat duct. Non-antiperspirant deodorants use either synthetic agents such as, for example, triclosan, or natural antibacterial extracts such as tea-tree oil, or peppermint, or lemon, to kill bacteria. An unscented deodorant will still carry the scent of whichever plant extract it contains. The two different approaches are, antiperspirant stops sweat, and deodorant lets you sweat but stops it from smelling. If something is labelled antiperspirant deodorant then it usually just means perfumed antiperspirant, or could be that the deodorant is the second line of attack if the sweat overcomes the antiperspirant. But the cycle continues. As described earlier, this deodorant has to be completely removed after it has worked for a few hours, because the very vehicle it sits in, beeswax, oily cream or a gel, will harbor bacteria that are a time bomb, waiting to defy your efforts to wash it off. The cleansing stage of this cycle is more effective than the deodorant stage, as long as it is done extremely thoroughly. Many people who are confounded by odor issues shower or bathe without getting clean or addressing every part of the body. Between showers, a moist towelette can swipe away most bacteria to keep you fresher for longer. PreviousPrevious post: Have I already bought my last ever combustion engined car? NextNext post: Different ways to clean Jalousie (louvered) windows.